So much going on that I want to share on the blog. I can’t wait to show you finished photos of a home in Houston that was completed recently. That will be up soon. Later this week or Monday. I am also working on this exciting project in the East Shore area of The Woodlands, Texas. This has been such a fun house to work on. 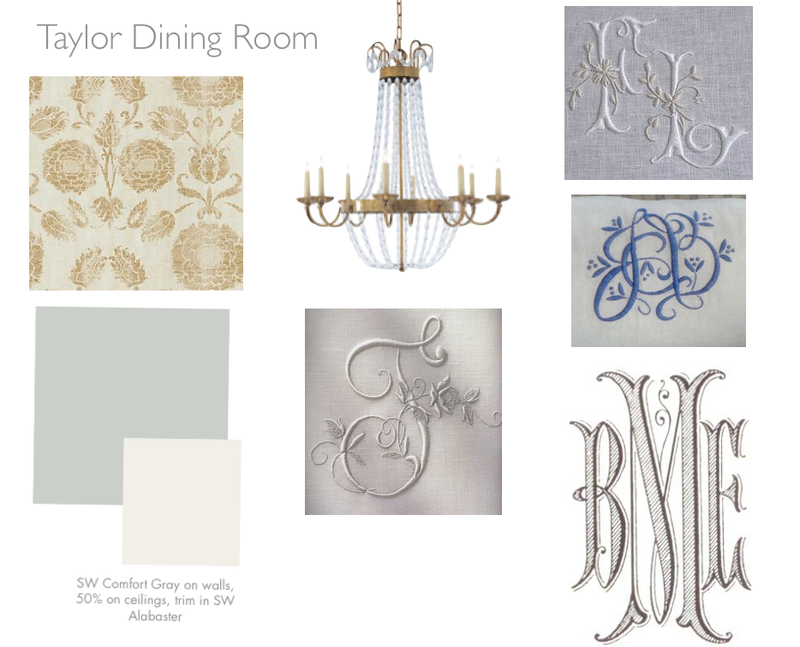 Today I am brainstorming with the brilliant Laura of LS Slipcovers about the custom dining room slips and hand embroidered monograms she is going to be doing for the project! This room is going to be so gorgeous with cypress doors and pine builtins, the gorgeous print in the top left corner (called Venetian Ottoman from Calico Corners if you are interested) will be drapes, and the Paris Flea Market chandelier from Circa! The walls are going to be SW Comfort Gray and the main art in the room….a beautiful white christening gown. Does anything sound more Southern and lovely than this combo. And the homeowner is so nice and lovely to work with which makes it extra fun. I am so excited about these monograms having little flowers or embellished details…and I love the fishtail font don’t you. I have a post on the washing and caring for these intricate monograms in the works too. I have also been looking at wallpaper this week. I might have gotten a bit excited when one of my favorite clients said “I might be open to wallpaper in the master bedroom!” I went nuts pinning wallpaper last night. Some of my faves. Schumacher This paisley from is called Kerala. So classic and pretty. Another gorgeous paper from Schumacher, this Hothouse flowers by Celerie K in blue. My clients always love blue for bedrooms which is a wise choice of course, blue is so soothing and pretty. AND WOW look at this bedroom. 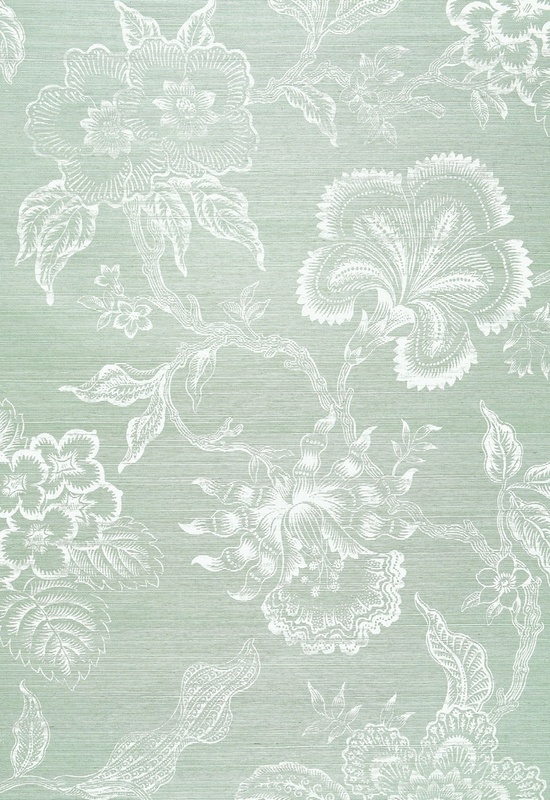 I adore Thibaut paper and fabric and this paper, called Baron, is one of my fabrics. I love how its used here with so many other patterns. Fun to see a traditional design look so edgy and eclectic! Speaking of Thibaut, I just received my new wallpaper and fabric books from them and can’t wait to look through them all! If you live local and want to order Thibaut I can meet with you to look at books or I can work with you online to order Thibaut. So excited to be carrying this full line. I have had an account for a while but never all of the books so this is fun! Have a great rest of the week! Check back soon for more photos of some recent projects! I have loved Thibaut for a long time! One of my faves is the Lilian pattern. 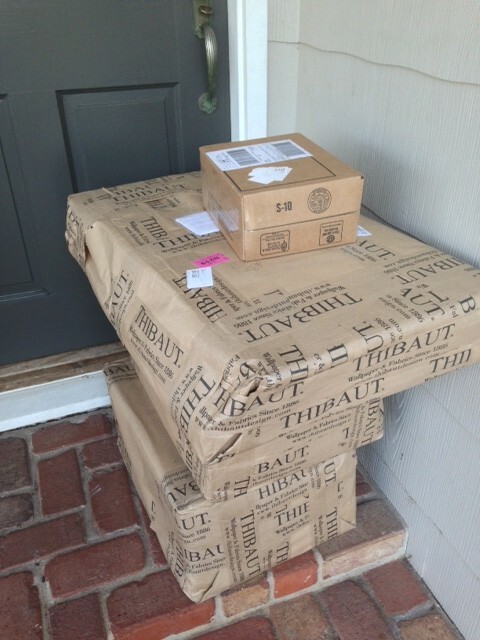 How exciting to have all those Thibaut packages on your front stoop! Omg- this room is so me! I want to see in your thibuat packages!!! This all looks so great! Love it! I am always so excited to see your projects…..such exquisite taste you have! Been loving Thibaut wallpaper lately….just used one of their papers in a project and about to use another. The price point is so good. Love all of this! 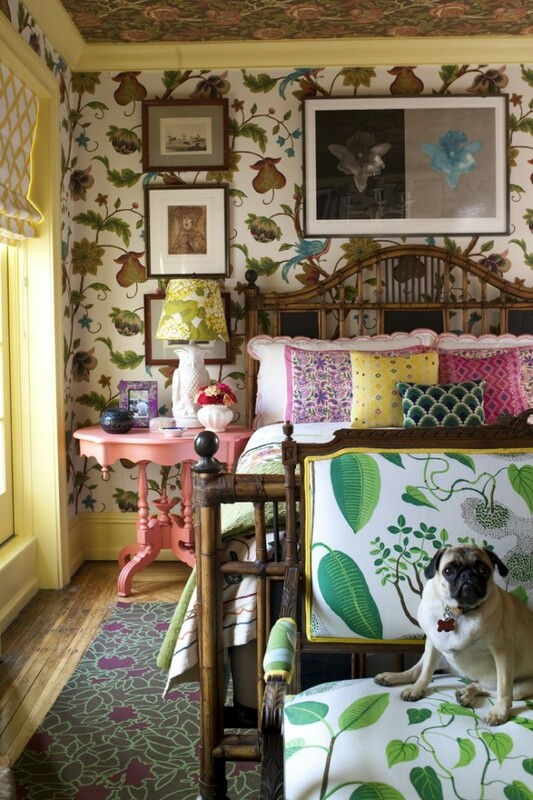 But especially the hothouse flowers wallpaper and the monograms. Be still my heart!!! 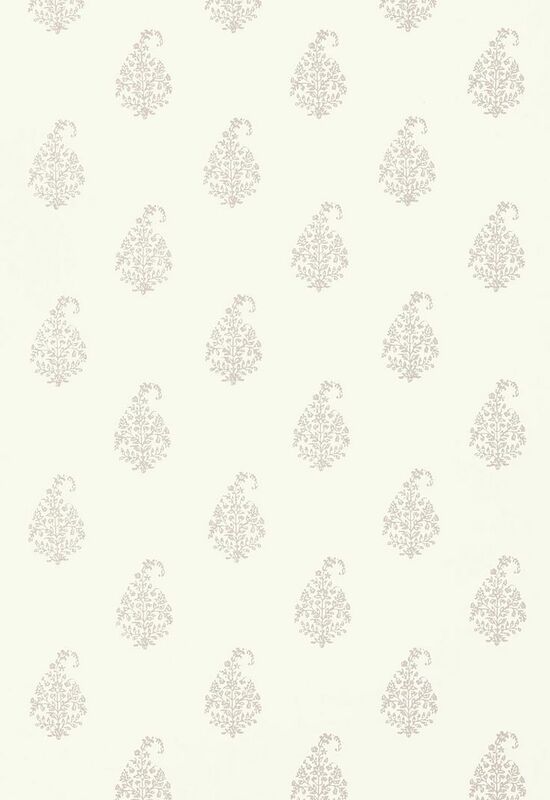 I like the new trend that seems to be taken hold…wallpaper or stenciling. These choices are so pretty.